We continue to be busy in the vineyard. We’re doing shoot training as part of canopy management. The training of vines is essential to achieve desired vine structure and promote long term vineyard productivity. We are also de-leafing. De-leafing is when you remove the two lowest leaves from each vertical shoot, and exposing the developing grape bunches to direct, rather than filtered, sunlight. It also creates better ventilation for the grapevine which minimizes the possibility of mild dew. For the same ventilation purposes, we’ve already started a minimal amount of fruit cropping. A little bit of organic fungus spraying has been done on the vineyard as well. We have yet to see veraison which is the “change of color of the grape berries.” Veraison represents the transition from berry growth to berry ripening, and many changes in berry development occur at veraison. 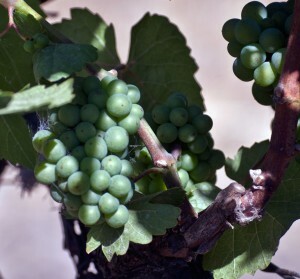 We expect that final stage of grape growth in mid August.